Moscow on Saturday hit back at Brussels for not condemning the unrest that resulted in the seizure of government buildings by pro-EU protestors in Ukraine. “Why are there no voices condemning those who seize government buildings, attack the police and adopt racist and anti-Semitic slogans? Why do European leaders actually encourage such actions, when they would quickly move to punish them at home?” Russia’s Foreign Minister Sergei Lavrov said on Saturday. 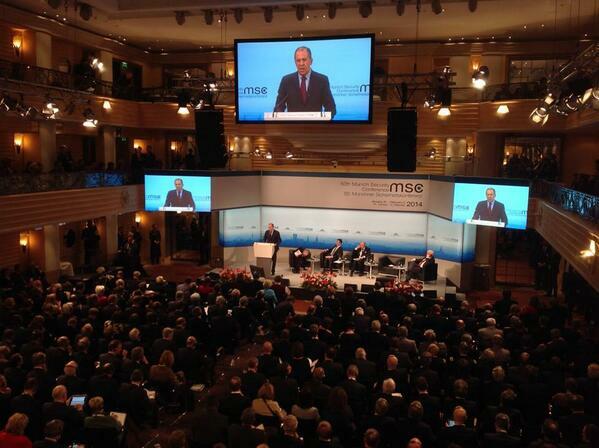 Lavrov was speaking at the annual Munich Security Conference. Several government buildings, including the Justice Ministry in Kiev, have been temporarily occupied by demonstrators during the protests. Taking a swipe at Moscow, US Secretary of State John Kerry said the Ukrainian opposition had the “full support of President Obama”. “Nowhere is the fight for a democratic, European future more important today than in Ukraine. The United States and EU stand with the people of Ukraine in that fight,” said Kerry at Munich. Meanwhile, Lavrov echoed the Russian President Vladimir Putin who had said in Brussels earlier this week that meddling in Ukraine’s domestic affairs is unacceptable. “What would be the reaction from the European Union, if members of the Russian government began to openly express support, including personal visits, to rioters in London, Paris or Hamburg?” Lavrov asked. Protests in Ukraine began last November after the government reversed a decision to sign a long-awaited trade deal with the European Union. As the crisis intensified, Ukraine’s Prime Minister Mykola Azarov and his cabinet have resigned. Ukrainian President Viktor Yanukovich on Friday signed into law an amnesty for demonstrators detained during mass unrest and repealed anti-protest legislation.